Sir Oliver Joseph Lodge (June 12, 1851 – August 22, 1940) was a pioneer in the science and technology that led to the development of radio. Besides his work in physics and radio technology, he was known for his interest in the paranormal, and he wrote a book about communicating with his son who perished in World War I. In later life, he lectured widely on the existence of the spiritual world. Born in Penkull, Staffordshire, Lodge was the eldest of eight children of Oliver Lodge, a vendor of supplies to the local pottery industry, and Grace Heath. Among his brothers and sisters were the historian, Sir Richard Lodge; Eleanor Constance Lodge, historian and principal of Westfield College, London; and Alfred Lodge, a mathematician. Lodge attended Adams' Grammar School, but his interest was sparked when, during a visit to London, he was encouraged to attend lectures on scientific subjects. Some of these were given at the Royal Society of London by John Tyndall, the renowned physicist. When Lodge was 16, he enrolled in educational courses in South Kensington, and succeeded in obtaining the highest grade in his class. When it became apparent that he excelled in scientific subjects, his father gave up the idea of having his son work for him, and Lodge was allowed to pursue a career in science. He obtained a scholarship to the Royal College of Science in London, where he studied from 1872 to 1873. In 1873, he entered the University College London, where the curriculum included advanced mathematics. Lodge was inspired by the electrical theories of James Clerk Maxwell, who demonstrated theoretically that light is a form of electromagnetic radiation. During this period Lodge had attended lectures by Maxwell, and would later conduct a brief correspondence with the famous scientist. Lodge graduated in 1875, and was awarded his doctorate in 1877. Lodge then married Mary Marshall, who over the years would bear him six boys and six girls. At this time, he supported himself and his wife by serving as a research assistant at University College, and by giving lectures in physics at a nearby college. In 1881, he was appointed professor of physics and mathematics at University College, Liverpool. Lodge then traveled to Europe to procure equipment for a new laboratory, and there he met Heinrich Hertz, who was at that time an assistant to the famous physicist Hermann von Helmholtz. Hertz would become the first scientist to publish successful results on the production and detection of electromagnetic waves. It was during this period that Lodge developed an interest in paranormal phenomena and spiritualism, which he was to pursue throughout his lifetime. After completing his doctorate, Lodge worked with the Irish physicist George Francis Fitzgerald to clarify the implications of Maxwell's theory of electromagnetism, and to explore the way in which electromagnetic waves could be generated from circuitry. At that time, however, Fitzgerald did not believe such waves could be produced, and Lodge, in deference to Fitzgerald's judgment, temporarily gave up his attempt to produce them. In 1883, Fitzgerald reversed his own position and calculated the energy of the waves that could be generated by electromagnetic oscillations. In the late 1880s, Lodge became interested in lightning, and believed that lightning rods would fail to work because of a phenomenon called inductance, which opposes the unfettered conduction of electricity in even good conductors such as copper. As a result, he insisted that a lightning bolt will not always take the path of least electrical resistance offered by a lightning rod. He experimented with the leyden jar, a simple device that holds a static electric charge, and compared its discharge in the form of a spark with lightning. While some of his ideas in this regard proved to be mistaken, they led to his discovery of electromagnetic waves. During a series of lectures on lightning he gave in 1888, Lodge realized that he could create what are called standing electromagnetic waves along a wire in much the same way as a single note and its overtones are produced in a musical instrument. These were radio waves, which were like light waves but of a much lower frequency. In July of 1888 Lodge submitted his results for publication in the form of a paper titled "On the Theory of Lightning Conductors," in which he clearly discusses the velocity, frequency, and wavelength of electromagnetic waves produced and detected in a circuit. Before the paper went to print, however, he discovered that Hertz had already published a memoir in which he described his efforts to generate and detect waves transmitted across space. Lodge credited Hertz in a postscript to his own paper, which was published later that year. In a well-publicized lecture in 1894 on the work of Hertz, who had passed away earlier that year, Lodge demonstrated the possibility of using electromagnetic waves as a medium of communication. He then formed a partnership with Alexander Muirhead, an electrical engineer, to develop commercial applications for his discoveries. Lodge, alone and in conjunction with Muirhead, patented several inventions relating to radio communication in Great Britain and in the United States. The two men formed the Muirhead Syndicate in 1901 to manufacture radio equipment, but in 1911, their patents were bought out by radio pioneer Guglielmo Marconi and the partnership was dissolved. In 1943, the United States Supreme Court relieved Marconi of some of his U.S. patents in favor of Lodge and other early inventors of radio technology. 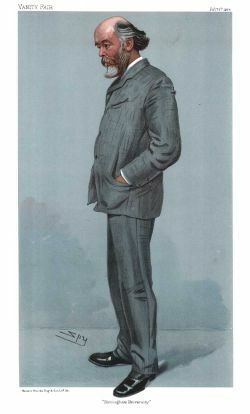 In 1900 Lodge moved from Liverpool back to the Midlands and became the first principal of the new Birmingham University, remaining there until his retirement in 1919. Lodge was awarded the Rumford Medal of the Royal Society in 1898 and was knighted by King Edward VII in 1902. In 1917 and 1918, Lodge engaged in a debate with Arthur Eddington over the validity of Albert Einstein's theory of relativity. Lodge proposed his own theory, called the "electrical theory of matter," by which he hoped to explain relativistic phenomena such as the increase of mass with velocity. Lodge continued to write and lecture in the remaining years of his life, particularly on life after death. He died on August 22, 1940, and is buried at St. Michael’s Church, Wilsford (Lake), Wiltshire. To create a detector of radio waves that was more sensitive than a spark gap, Lodge improved a device invented by Edouard Branly. It is called a coherer because it relies on the fact that iron filings enclosed in a glass tube will clump together in the presence of radio waves and conduct electricity. Lodge devised a "trembler," which dislodged clumped filings and reset the device. The coherer served as an on-and-off switch triggered by radio waves, making it possible to transmit alphabetic characters in code. On August 14, 1894, Lodge made what is often considered to be the first demonstration of broadcasting radio signals at the annual meeting of the British Association for the Advancement of Science, at Oxford University. This was two years before Marconi's first broadcast of 1896. Lodge patented the moving-coil loudspeaker and the variable tuner and other devices he had invented in pursuit of perfecting radio technology in the latter part of the decade. Lodge also made a major contribution to automotive engineering when he invented the electric spark plug for the internal combustion engine, called the "Lodge Igniter." Later, two of his sons developed his ideas and in 1903 founded Lodge Bros., which eventually became known as Lodge Plugs Ltd.
Lodge generally opposed Einstein's special and general theories of relativity, and proposed his own, which he called "The electrical theory of matter." Through this theory, Lodge attempted to explain the deviations of Mercury's orbit around the Sun from what is predicted by Newton's theory. Lodge attributed the discrepancy to a kind of inertial drag generated by motion relative to the "ether," the hypothetical medium in which electromagnetic waves are propagated. Lodge is also remembered for his studies of life after death. He first began to study psychical phenomena (chiefly telepathy) in the 1880s through the Society for Psychical Research. In the 1890s, Lodge participated in seances. He wrote several books based on his experiences with the paranormal, including one in 1890 in which he analyzed 22 sittings with a Mrs. Piper, an American psychic and spiritual medium. After his son, Raymond, was killed in World War I in 1915, Lodge visited several psychics and wrote about the experience in a number of books, including the best-selling Raymond, or Life and Death (1916). Altogether, he wrote more than 40 books on topics including the afterlife, aether, relativity, and electromagnetic theory. Lodge was a member of the Society for Psychical Research and served as its president from 1901 to 1904. He was also a member of the British Association for the Advancement of Science. In 1889, Lodge was appointed President of the Liverpool Physical Society, a position he held until 1893. The society still runs to this day, though under a student body. Lodge was an active member of the Fabian Society and published two Fabian Tracts: Socialism & Individualism (1905) and Public Service versus Private Expenditure which he co-authored with Sidney Webb, George Bernard Shaw, and Sidney Ball. In 1898 Lodge was awarded the Rumford Medal of the Royal Society of London. King Edward VII of Great Britain knighted Lodge in 1902. Sir Oliver Lodge's letters and papers were divided after his death. Some were deposited at the University of Birmingham and the University of Liverpool and others at the Society for Psychical Research and the University College London. Lodge, who lived a long life, was a prolific letter writer and other letters of his survive in the personal papers of other individuals and in several other universities and other institutions. Electric Theory of Matter (Oneill's Electronic Museum). Retrieved June 20, 2007. Ether, Encyclopedia Britannica, thirteenth edition, 1926. U.S. Patent 609154 (PDF), "Electric Telegraphy" (wireless telegraphy using Ruhmkorff or Tesla coil for transmitter and Branly coherer for detector, the "syntonic" tuning patent) August, 1898. Sold to Marconi in 1912. Sir Oliver Lodge 1851–1940 First Spiritual Temple. History of "Oliver Joseph Lodge"
This page was last modified on 20 December 2018, at 16:12.